Takamovsky’s second solo album works on the basic premise of juxtaposing the harmonies and structures of early music with electronic sounds. Specifically, the tracks – according to the press release – revolve loosely around a bourrée from Bach’s Cello Suite No 4, BWV 1010, which also simultaneously forms the start and end of Sonic Counterpoint.’ As such, it’s both an electroacoustic work, and a work of traditional and contemporary classical music. Thudding bass beats and clicky microbeats flicker through the spaces in the delicately picked acoustic guitar notes. Initially, the swirling synths are soft-edged, rounded with, the overall feeling is of a very organic nature, but on ‘Sun’, burrs of white static fizz and cut through the soft tones, bringing a harsher edge to things, and the medieval-sounding picked string motif accompanied by a drum ‘n’ bass rhythm and squiggling blurts and bleeps brings the notion of contrast and counterpoint prominently to the fore. The balance and relationship between electronic and acoustic sounds swings between the tracks. 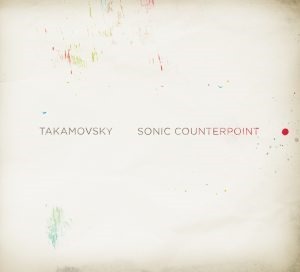 It’s perhaps noteworthy, albeit in some small way, that the ‘electronic’ aspect of the compositions is limited to beats and extraneous noise, and as such, the separation between the two worlds is rendered apparent in Takamovsky’s approach. ‘Running in the Background’ is the first and only track to feature vocals, and consequently stands out as something of an oddity – but then again, vocals and lyrics provide a counterpoint to instrumental works, so perhaps it works in context of the theme. The final track, ‘D.C’ is a deep, fuzz-tines swirl of dense, overloading semi-ambient noise, a purely electronic revisioning of the bourrée. It’s interesting, both sonically and conceptually, and although it does seem that it’s not an especially original concept, or that its execution is exactly the height of innovation, it’s still not without merit.